were Sydney Gardens where Jane Austen used to walk and she set part of her novel “Northanger Abbey” in Great Pulteney Street. 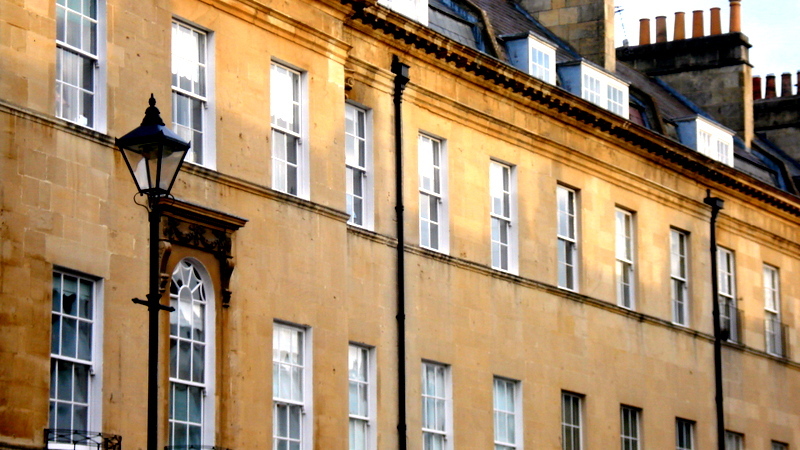 Jane Austen’s house was at number 4, Sydney Place, just off Great Pulteney Street. The street has housed important figures in Bath’s history, including William Wilberforce, the great reformer, and William Smith, who produced the first geological maps in the world. It has also been home to royalty. At other end of Great Pulteney Street is the exquisite Pulteney Bridge, one of only a few bridges in the world built with shops on. It was designed by Robert Adam and finished in 1773. These all were built to extend the City of Bath and commissioned by Sir William Pulteney on his land. Unfortunately the money ran out Thomas Baldwin so an even grander plan was left unrealised, You can see the “side streets” from Great Pulteney Street are very short and undeveloped – the plan was to continue the grandeur in similar style. Still, it is easy today to see why the street attracted the great and the good of Georgian Bath.